Florida, North Dakota, South Dakota, Utah, and Wyoming rank as the top five states. Oil and gas revenue account for the high ranking of some of the states, but declining revenue from these sources has seen some states, such as Alaska, drop out of the top five. The bottom five ranked states are Maryland, Kentucky, Massachusetts, Illinois, and New Jersey. 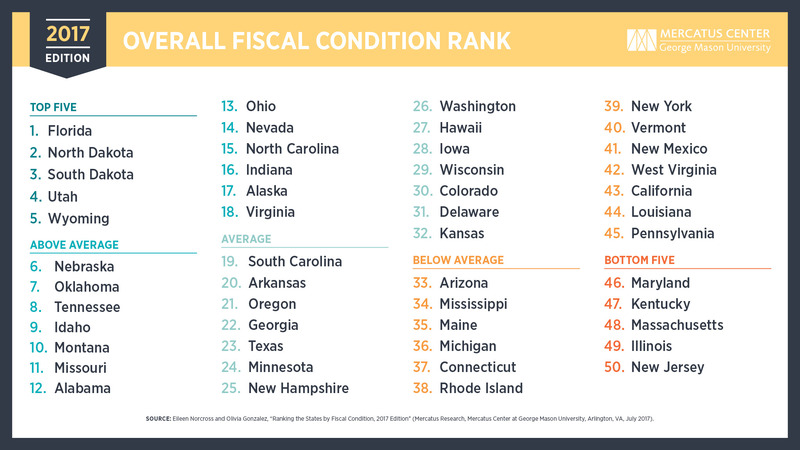 Each of the bottom five have urge debt obligations and unfunded pensions and healthcare liabilities play a major roll in low rankings. Last night at a meeting of the Bastiat Society, the guest speaker was Justin Wilson, Comptroller of the Treasurer for Tennessee. He spoke of Tennessee's sound financial standing and pointed out that Tennessee is almost alone as a state with no debt for road construction. He also said Tennessee's pension obligations are actuarialy sound and that Tennessee is transitioning from a defined benefit pension system to a defined contribution pension system for new hires. Tennessee is not using one-time monies to fund on-going expenditures. By any measure, Tennessee is fiscally responsible. As Tennessee's fiscal health has been improving, Tennessee has reduced the State workforce by about 5,000 people and services have not suffered. Our ranking for the quality of our public education has increased from among the worse three or four in the nation to a ranking in the mid-twenties. Also, the number of college educated adults has been increasing. We can rightly be proud of the job Governor Haslam and our Republican dominated legislature are doing. To read the full article or delve deep into the details of the data that supports the rankings, follow this link.